How To Celebrate Your Relaxed Hair When Everyone Is Going Natural! 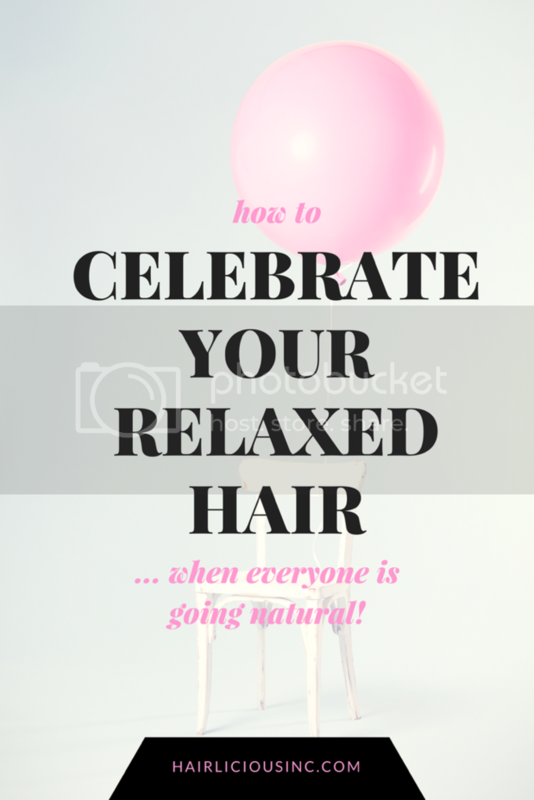 - Hairlicious Inc.
How To Celebrate Your Relaxed Hair When Everyone Is Going Natural! Having relaxed hair nowadays appears to be rapidly becoming a "thing of the past" as many ladies are returning to their natural hair. While this is great news, many ladies (like myself) still choose to remain relaxed, for various reasons. As a relaxed haired individual, I frequently hear the common phrase "when are you going natural?" I then think to myself, "am I supposed to go natural? ""is going natural expected of me?" and then it dawns on me "hey? I am still enjoying my relaxed hair! I don't feel the need to return to my natural hair right now". This lead me to think that though many have decided to go natural, it's important for me not to forget all the fantastic things I love about my relaxed hair, the way it is! Focus on the reason why you choose to remain relaxed. Make an effort to remind yourself of these reasons - often. Write a “love list” about your hair. Invest energy on what you like/love about your hair while relaxed. Highlight all the things that you are grateful for i.e. hairstyles that you love on your hair, products that agree with your hair, etc. Whatever it is, write it down! Find reasons why you truly love your hair in its relaxed state. Zone in on your goals that you would like to achieve while relaxed. Keep your eye on the prize. Reward yourself, and your hair, with a product or tool you’ve been eyeing for months. Give your hair the gift of extra time. Pamper your hair will all the things it loves i.e. deep conditioning with your favourite DC, oil treatment, or prepping your hair for your favourite hairstyle. Put some happy in your hair journey. Find a gorgeous photo of relaxed hair that you love, i.e. hair idol, and make it your wallpaper on your computer, smartphone or stick it on your vision board to remind you of how beautiful relaxed hair is. Photoshoot! Nothing like a hot selfie to get you going. Make it fun, make it you! You”ll be glad you documented the moment. Celebrate your relaxed hair and all the joy it brings! I needed to see this today. I was relaxed, went natural, went back to relaxed and now I'm seven months post and considering going natural again. But I miss the ease of my relaxed hair. I have told myself that my hair is my hair and I shouldn't worry about changing my mind about going natural again because at the end of the day I have to take care of my hair and no one else. I think seeing this reminds me that there are still beautiful relaxed ladies out there and there is nothing wrong with it. When is the site coming back? Very soon. Still working on a few sudden technical errors. Thank you for your patience! Hey Sunshyne this us off topic but u see that the countdown of the new hairlista site has finished. When will the new Hairlista website will be up? I surely miss it. Hi Manda! Thanks for inquiring. Yes today was the day but a few errors preventing me from launching it. Still working them out. The site should be ready soon. Keep checking back. These are such great tips! The relaxed journey can feel lonely at times. But, I'm learning that doing what I love with my hair is truly a journey in self love. It is honoring my choices and embracing my right to do me for me. And knowing I don't have to apologize for my choices. Healthy hair is beautiful hair!! Thanks for this article. I was natural for several years but I love the flexibility of relaxed hair. Plus, it makes it easier for me to style my thick long hair. Feel happy to read this article. My suggestion is to must try natural remedies for hair growth . I am sure you will be relaxed and love your's hair very soon. My Wash Day Routine - Updated!